On April 5, 2016, the Cleveland Cavaliers visited the Milwaukee Bucks at the BMO Harris Bradley Center and recorded a 109-80 victory. Once again, dynamic 6' 3" guard Kyrie Irving made key contributions to the offense by scoring 15 points with six assists as J.R. Smith (21 points), LeBron James and Kevin Love (17 points apiece) paced a balanced Cavs attack. This lot features Irving’s game-worn and autographed road jersey from that particular game during the Cavs monumental championship season. 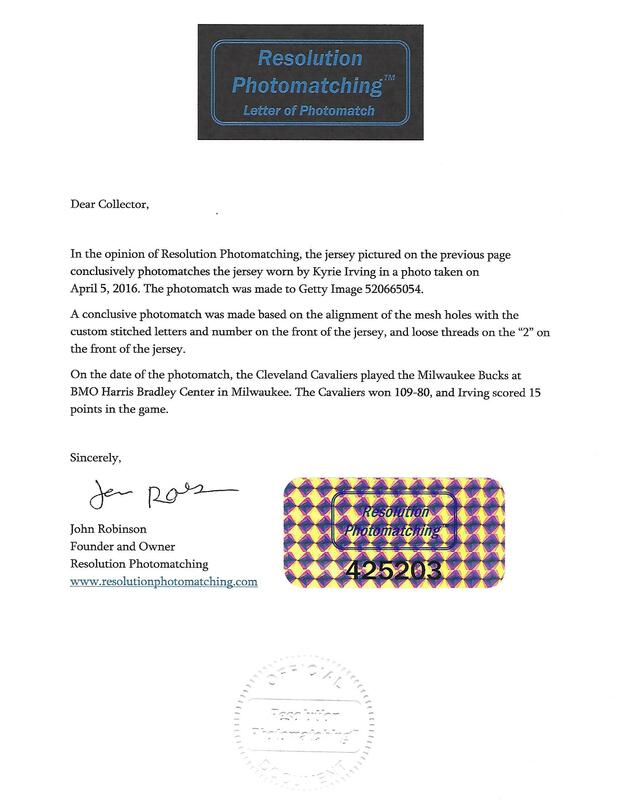 It comes with a team letter and has been photo-matched by the experts at Resolution Photomatching. Following this 4/5/16 game, the Cavs went on a magical run and were triumphant in delivering the city of Cleveland its first professional sports title in over 50 years. In the waning moments of Game 7 of the NBA Finals, it was Irving who sank the game and series-clinching 3-pointer over reigning MVP Stephen Curry. 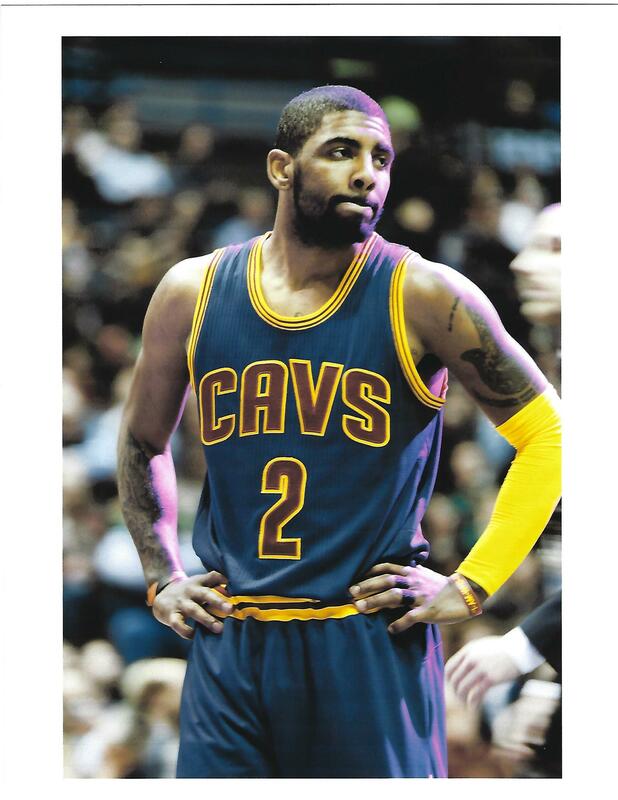 This past off-season Kyrie left Cleveland for the Boston Celtics in a blockbuster trade that is sure to make the Eastern Conference race interesting for years to come. The Cavalier navy blue alternate jersey has “CAVS” on the front in wine tackle twill outlined in gold with “IRVING” on the back in gold tackle twill letters. His No. “2” appears on the front and back in wine with a gold border. 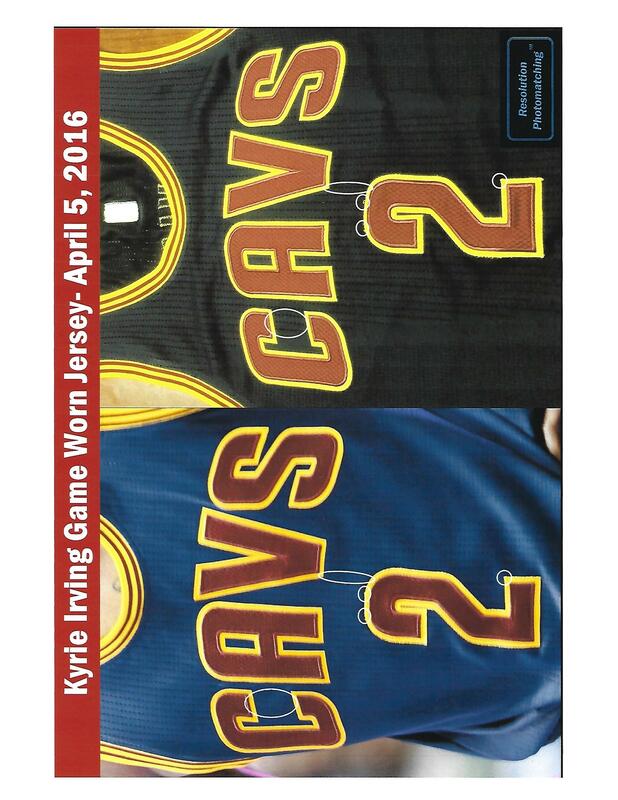 The sleeves and collar have wine and gold striped elastic trim. Embroidered NBA logo patch sewn on upper back. Shirt has appropriate Adidas Size XL tagging with "Length +2" flag tag on the front left tail. The adjacent NBA Authentication tag has serial #CCA03184. The bottom of shirttail has an upside down gold-colored tag reading “All for one. 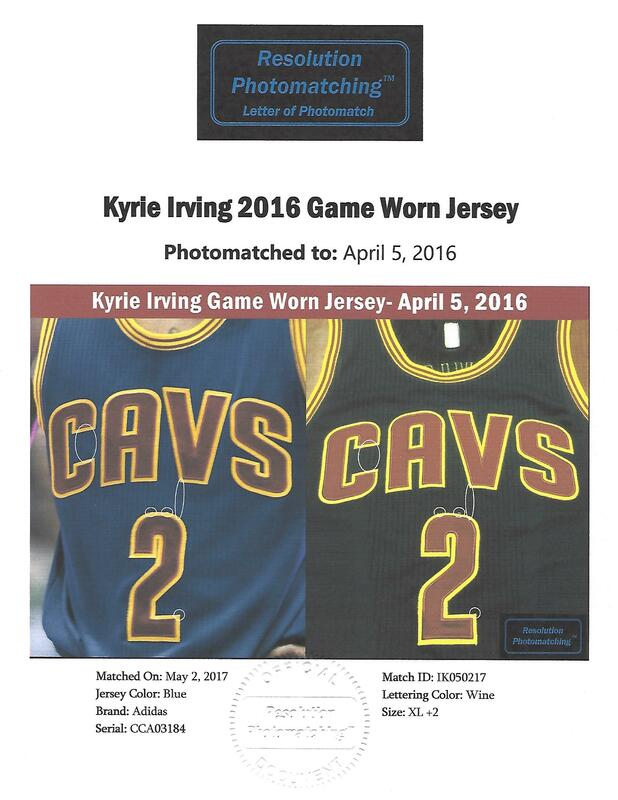 One for all.” Irving signed the back of the jersey in fairly faint silver marker which remains legible against the dark blue mesh fabric. Inside the left inseam is the washing instructions tag. Shirt exhibits excellent wear and is photo-matched to Getty 520665054. 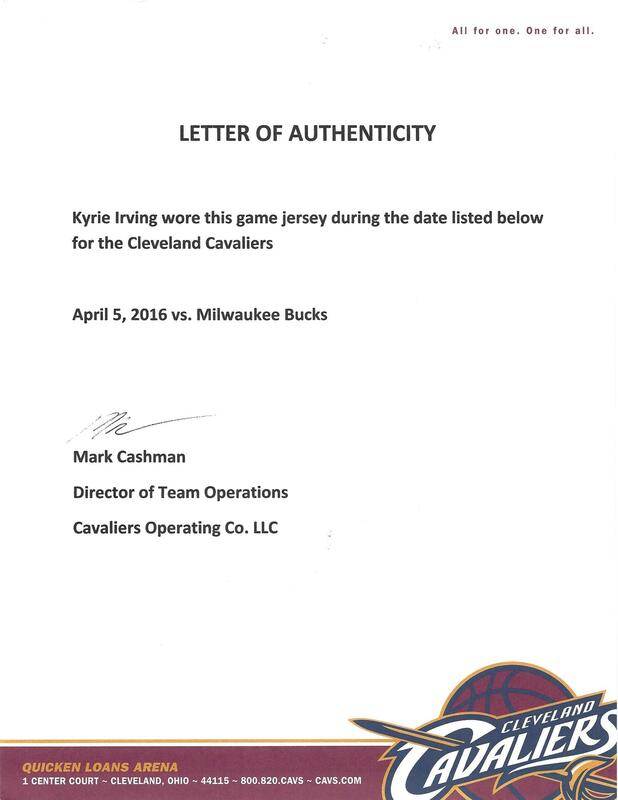 Includes LOA from Mark Cashman, currently the Cavs' Director of Team Operations who previously served as team equipment manager for 10 years. LOA from Resolution Photomatching (Please not that the initial image from SCP had significant glare making colors appear different; they are not.) Autograph pre-certified by PSA/DNA.